AI-powered audio mastering plugins for maximum quality with minimum effort. 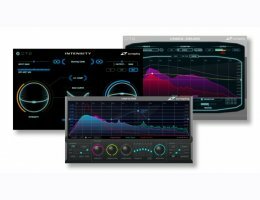 Zynaptic 's award-winning "smart" equalizer UNFILTER solves any EQ problems auto-magically (or manually, if preferred), with stunning precision, an incredibly quick workflow, and pristine quality. Carve out the details and character of your audio, add clarity, increase density, and boost loudness without breaking a sweat using INTENSITY. Change the level and punch of drums in a mixed recording or on the drum bus using our source separation based UNMIX::DRUMS. Whether you are a mastering or mixing engineer, music producer or artist, the MASTER Bundle will save you massive amounts of time while providing unbeatable results! Source Separation-Based Control of Drum Level in Mixed Music. SMOOTH and PUNCHY Boost Modes. Frequency Dependent Control of Key Parameters.